North Denver is not the ideal spot for a winery, but Clyde and June Spero have been making it work since 1996. Born to Italian immigrants, Clyde is definitely an old-school winemaker. In homage to his Italian ancestors Spero imports all of its uniquely shaped wine bottles from Italy. They have sourced their grapes from a variety of locations, including their own vineyard in Denver (which has since been removed), but also Palisade, CO, Lodi, CA and even an unlikely vineyard in Pueblo, CO. Spero's wines are definitely unique and quite popular amongst their supportive customer base. If you're looking for a new wine experience in Denver, stop by Spero's recently updated winery and say hello to Clyde and June! I have made wine all of my life. 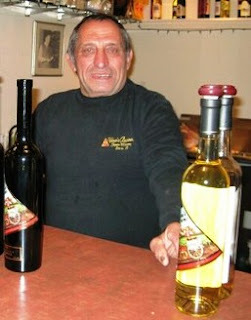 My father was born in Potenza, Italy and he had learned wine making from his father. When he came to America, he continued the family tradition of making table wine for the family. I grew up helping him and as an adult I made my own wine for my family. I decided to begin a winery as my retirement business. I started with a small vineyard in Denver in 1996, with my eye on retirement in the future. The future is here. I became a full-time retiree (making wine as my only business) in 2007! Visit other wineries and drink their wine. I make all of the wines I want to make. In Italy, so I could enjoy the country and life style. My Napa Valley old vine Zin, which sold out in two weekends. Verdi, who wrote opera for the people, and sometimes Puccini, who wrote for the angels! Consumers should think of the uniqueness of the Colorado grape. It seems to produce more fruity, less tannic and more intense wine flavors, that always remind you that the wine came from a grape (the fruit is essential)! They should also consider the varied styles of the wine makers and the diversity of CO wines. We have the unique geography that can produce a variety of vinifera grapes as well as hybrid grapes, giving CO a very unique place in the market. The consumers should think about the variety of wines being produced by the approximately 100 Colorado wineries, and determine that there are some wines and some wineries for every palate, and they should enjoy exploring what is available right here in their own state. There is so much good wine available! The continued growth in quality each year, making CO wine competitive with other states and countries. What are the customers expecting in CO wines? What quality? What price? I think customers are expecting wines without flaws at less than $20. When a wine is more than $20, it better be very good. And what exactly is a Twitter Taste-off?